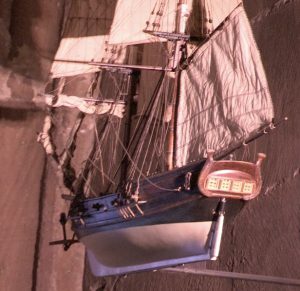 At the end of 2004, the Society of Friends was bequeathed a ship model by the last Sheriff Stanley Gimson with the request that the two-masted brig be hung in the Cathedral in the manner of a votive ship as a reminder of the Clyde’s tradition of shipbuilding. After discussions with Historic Scotland it was agreed that best location for the ship would be the St Nicholas Chapel at the east end of the Lower Church, – St Nicholas being the Patron Saint of Sailors. At the end of February 2007, the ship was installed on the south wall of the Chapel. Votive ships have been hung in churches for many hundreds of years and may have been gifted in thanks for safe delivery from a perilous journey or as a simple reminder to the congregation of a long standing association with the sea or shipping and the community’s indebtedness to those who risk their lives in the business of fishing and trading. Last October the Society outing visited St Monans Church in Fife, where two such models can be seen. The ship is fixed to the wall by a very slim bronze bracket, commissioned by the Society, and, as is customary, faces east with its bow slightly raised. As the model is fixed quite high up on the wall, the best vantage point is from the top of the steps leading down to the St Nicholas Chapel. I am sure that the ship will be of great interest to the many visitors who come to the Cathedral.